Generosity is defined by Webster’s as “the trait of being willing to give of your money or time.” It is true that when you think about the word generosity your mind jumps for a monetary gift to someone in need, but not every act of generosity has to have a monetary value. Generosity can take many forms as Mike and I have learned over the last two years. Generosity can be a simple act of kindness to another human being…simple words that bring peace to the soul of another…it can be as simple as listening to a friend and sharing in their pain or their triumph…it can be a friend or stranger picking up a garage sale flyer or seeing a CHD video and making an anonymous phone call to a foundation about a family they know. A simple act of “generosity” that can change someone’s life forever…the giver may never fully appreciate the depths of their act or the impact of their wiliness to take action, but for the recipient the act will never be forgotten! This is how we were introduced to Just Heart Foundation…a simple generous act that has bestowed even greater generosity onto our family. 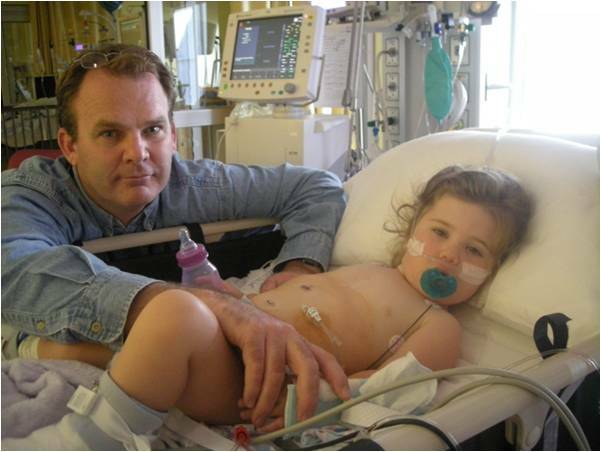 Just Heart Foundation is changing our lives and giving us another miracle. Since our first miracle, Susan Faith, was born with a life threatening heart condition, we have struggled to meet the financial needs of our family. Mike and I have shared many things in our CarePage over the years, but have kept our personal financial struggles fairly private with only a couple of exceptions. Susan Faith’s birth changed our lives and it also changed our lifestyle…Our family willingly made the sacrifices that were necessary for our beautiful daughter and have never looked back. You see we were given the option to terminate our pregnancy upon Susan’s CHD diagnosis during my 20 week prenatal ultrasound, but CHOSE life for our baby and have never regretted that choice…Not Once! Upon her birth it was necessary for me to quit my job to be able to meet her special care needs on a daily basis. This reduced our families income by more than 50%...We worked hard to pay off items or reduce debt before she was born…We moved our family into a home that reduced our household expenses…The kids all had to make sacrifices too…and have continued to willingly do so as life with Susan has changed many of the things we are able to do as a family. That first year we lived in a state of crisis barely functioning...We were fighting to save our child’s life…We rarely slept….We were unable to think past the moment. We struggled financially and used credit cards to survive each month. That was not the right choice looking back, but at the time we just were existing and unable see past tomorrow. HE did…HE showed me another way. We started to collect items from friends and neighbors to sell and raise money. We had our first Benefit Garage Sale and made $1100 in a weekend…We met wonderful people during these events and they often would come back with donations for us. The small group of people donating turned into a larger group. THERE WAS A WAY! We have continued to have Susan’s Benefit Garage Sales as often as possible to help bridge our monthly financial gap. It doesn’t get us all the way there but it helps…We are helping ourselves…and feeling good about it! Mike and I dreamed of a HOME…not a house for our family to live in for a while, but a place to call HOME! We set that dream aside a long time ago along with family vacations, new clothes, newer safer cars, and all the other things we’ve had to just say no to along the way. Saving money for a down payment for a home has been out of the question…We have struggled to provide basic necessities like; Susan formula, electricity, gas, and to just keep a roof over our heads. This afternoon Mike and I are closing on our FOEVER HOME! Our dreams providing a stable living environment for our family for years to come is happening! This will also bring us much closer to being self sufficient as the new home will ultimately save us thousands of dollars a year. Just Heart has been amazing to work with and we feel blessed to be able to call Faith and Ryan Winters, our friends. We have experienced some amazing things along this journey…Every time an obstacle has been in our path…We have been given or shown a way through it. We have had help from so many people…We have meet some of the most wonderful friends during the most challenging time in our lives. We would not be where we are without the help from our family, friends, strangers and our community. Mike and I may never be able to fully express our gratitude to all of the wonderful people who have helped us over the last two years and a simple “Thank You” just never seems to be enough. We’d love to be able to repay every donation or gift we have received, but that is just not within our means…So we have chosen to pay other peoples generosity forward in ways that we are able to. Each time Susan has been hospitalized we try to reach out to families that are new to this community and offer them support, prayers and hopefully a little hope for the future. All day you stare down the unit and watch the body language of the new parents. You see the parents that can negotiate their way around the equipment verses the ones who are just a few days into their heart journey, tired already, scared, and full of questions. They need to hear they “Can Do It and It Will Be Okay,” to see a child ahead of them in the journey who is surviving. We have been blessed to welcome these families into our “Heart Family” and have also shared in the grief of those who have lost their battle with Congenital Heart Defects (CHD’s). This community is tightly bonded by the love of a child, the desire to beat the odds, the grief of losing a child, and a struggle to survive the #1 birth defect in the world. We have committed to raise funds to help other families like us and look forward to doing so. Thank you to each and every one of you who have continued to follow our CHD journey with Susan Faith…You all mean the world to us! We can’t wait to see what the future holds in our new home…THANK YOU JUST HEART!!!!!!!!!!!!!!!!!! !